Rabbit anti Bovine, Canine, Equine, Guinea Pig, Human, Mouse, Porcine, Rabbit, Rat, Sheep NUDT9 / NUDT10. 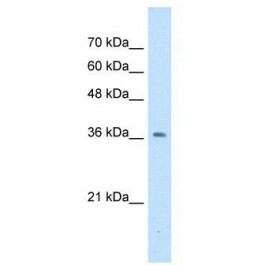 The immunogen for anti-NUDT9 antibody: synthetic peptide directed towards the N terminal of human NUDT9. Synthetic peptide located within the following region: MSGSNGSKENSHNKARTSPYPGSKVERSQVPNEKVGWLVEWQDYKPVEYT. The protein encoded by this gene belongs to the Nudix hydrolase family. Nudix boxes are found in a family of diverse enzymes that catalyze the hydrolysis of nucleoside diphosphate derivatives. This enzyme is an ADP-ribose pyrophosphatase that catalyzes the hydrolysis of ADP-ribose to AMP and ribose-5-P. It requires divalent metal ions and an intact Nudix motif for enzymatic activity. Altertively spliced transcript variants encoding different isoforms have been found for this gene. [provided by RefSeq, Oct 2011].